External DACs need that same low jitter clock! Industry solutions using off the shelf input receivers do not offer jitter at the levels a serious audiophile need. XO-DAC retimes the regenerated clock and delivers a new clock: equal frequency but at least 30 times lower jitter! The complete board is ready to mount, it is a little bit more cumbersome compared to mounting XO-2 or XO-3 but the result is definitely worth the trouble. Most commercially available DACs contain industry standard clock recovery circuits, producing typical jitter values up to, and over 200 ps. XO-DAC potentially reduces this to 8 ps. XO-DAC module contains a secondary PLL, with a carefully designed low frequency low-pass filter. Within that loop a low noise opamp drives a Tentlabs VCXO with low intrinsic jitter (3ps rms). The resulting clock is one that nearly matches that VCXO jitter. 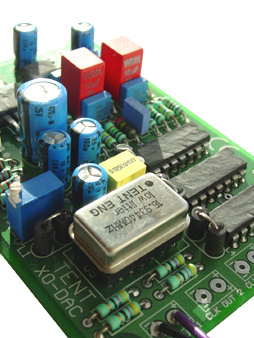 All electronics on board of XO-DAC are fed with a low noise power supply. It now exhibits a staggering low 5 nV/Sqrrt. Hz noise level within the critical range of 20 Hz to 100 kHz. That is 30 times quieter than an average LM317 based voltage regulator! Just to give you a hint of what we mean with "low noise"……..
All active stages have their own decoupling capacitor, and a novel compound RF series impedance towards the supply rail. It keeps it clean from RF currents generated by the clock and the logic circuitry on board of XO-DAC. XO-DAC sits on a double-sided PCB with ground-plane, to ensure signal integrity and maintain low jitter levels. XO-DAC is a small module, intended to be fitted in your DAC as an aftermarket upgrade. It offers a plug and play solution to effectively reduce the clock jitter. When your CD player or drive contains an XO3 clock board, TENTlink mode can be applied in conjunction with XO DAC. • Clock output 3: Specified frequency divided by 4 (when locked). This supports non oversampling DACs like many Audio Note types. New! XO-DAC retail price is set at € 184,03 each ex VAT (€ 219 each incl. VAT). All ex shipping cost. XO-DAC comes with al required wiring, fully assembled, tested and adjusted with a 5-year full warrantee. Look at the XO DAC mounting iinstructions for information on the connections.